I know it's cruel to have cookies staring at you on a Monday morning but I just couldn't wait to share these. Lent began last week and this year I chose to give up chocolate. I was doing great until day two when I realized I'd also be giving up my go-to breakfast that's perfect for the carpool lane. Valentines Day was also a challenge when the kids came home with their goodie bags filled with pink M & M's and chocolate Dove candies. And then...the Girl Scout cookies. Samoa's are my favorite. 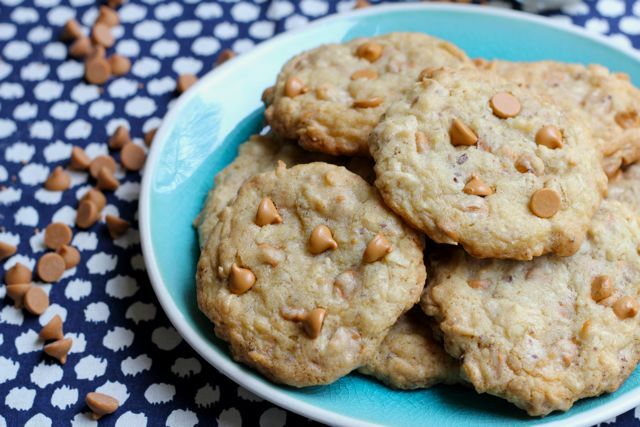 In an effort to stay strong, I whipped up these delicious butterscotch coconut cookies. They kept me on the right path this weekend and I admit, it's nice to try something different from my favorite chocolate chip recipe. As long as you don't overwork the dough, they stay very soft and chewy which is my preference. Hoping you enjoy these and wishing you happy reflections this Lenten season. 2. Combine flour, salt, baking powder and baking soda into a small bowl. 3. Using an electric mixer, cream the butter until pale yellow and fluffy. Add white sugar and brown sugar and mix well. Add the vanilla and the egg and mix on low until combined. 4. Add the flour mixture to the butter mixture using a wooden spoon and mix, being careful not to overwork the dough. Then, fold in butterscotch chips and coconut. 5. Using a tablespoon, drop dough onto cookie sheet, spacing cookies about 2 inches apart. 6. Bake cookies about 13 minutes or until golden around the edges. Allow the cookies to cool briefly on the cookie sheet and then transfer to a wire rack for additional cooling. Repeat the process with remaining dough. 7. Once the cookies have cooled, store in airtight container. These look delicious! I discovered you through Luci! You have a great blog! 2 of my all time favorite flavors. 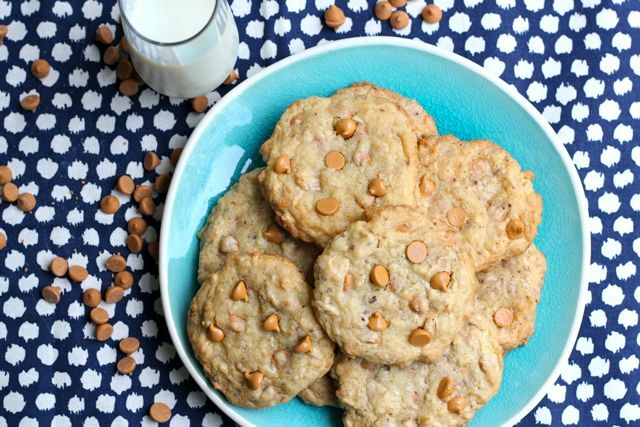 Butterscotch and Coconut!